Dang it, Grant. Great ideas here, I really like your work. But (see previous comments!) a joke lives or dies on its punch line. When you do a list of things, the order is Very Important. The last thing in the list is what the reader goes away with. Like, aha, it summarizes what the whole strip was really building up to. Instead of Wolf-Children, end it with the Failure or Cynicism panel. Or even Taking the Wrong Bus. Much more of an impact that way. That’s the cool thing about comics, aside from the visual effects, comics are functional for it gives moral values to the readers and of course it is always socially and culturally relevant, that’s why comic strips are still alive. People would still patronize comics for a lot of reasons. Totally disagree with Bill K here. Ending it on Wolf-Children leaves the reader with a bit of whimsy. 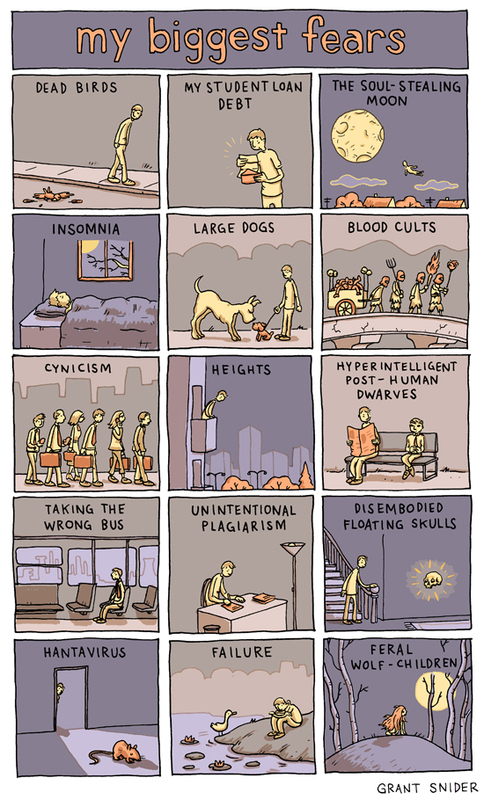 Going out on Failure or one of the more banal ones would be a real bummer. Are you really afraid of dead birds? I thought I was the only one!